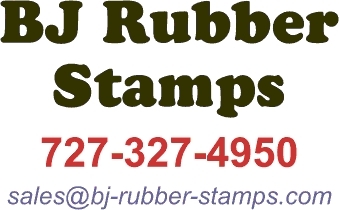 BJ RUBBER STAMPS is one of Florida's oldest stamp makers. A division created by Setchell Typesetting, which was founded in 1956, to generate work for their hot metal typesetting machines. The division grew to encompass the parent company and finally merged with the oncoming of the personal computer age. We are a full-line manufacturer of custom products including: stamps, daters, embossing seals, name badges, name plates, engraved signs, ADA/Braille signs, producing stamps for governments, corporations, banks, private business as well as for the general public at prices that are considered wholesale. By offering extremely reasonable prices, we have no need to use the "discounts" tactic. Our team consists of specialists in art designing, product development, merchandising and operations. A wide assortment of self-inking products such as Trodat, Ideal, 2000Plus, Multi-marx, Kwik, X-stamp, etc. are offered. Additional services include designing stamps from your artwork, line drawing or photos.